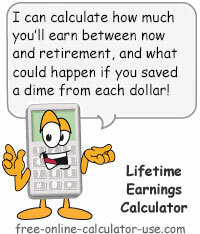 Lifetime Earnings Calculator, Plus "How To Turn the Tables On The Rich"
Enter the age you expect to retire or stop earning an income. You can either enter your gross annual income or your after-tax annual income, whichever you prefer. Enter without the dollar sign or any commas. If you choose to include the income of a spouse or significant other, you can either enter their gross annual income or their after-tax annual income, whichever you prefer. Enter without the dollar sign or any commas. Enter the average percentage by which you expect your income to grow each year between now and when you retire. Based on your entered assumptions, this is how much your annual income will be at retirement age. Based on your entered assumptions, this is your total earnings between now and when you retire. This calculator will estimate the annual growth of your income based on your anticipated annual cost of living (COL) increases. It will then add up all of your forecasted annual incomes, giving you the grand total of all of the income you will earn from working between now and when you retire. The purpose of this calculator is to make you aware of just how much money you (and your spouse/mate, if applicable) will have the opportunity to manage between now and when you retire. And the point this calculator will attempt to make, is that if it turns out you end up broke at retirement age, it won't be because you didn't make enough money. It will be because you did not successfully manage the abundance of income (potential wealth) you worked so hard to earn. Enter the age you plan to stop earning your income at. Enter your current annual income. Enter a second income if you want one included. Select the percentage you expect your annual income to increase by each year. Click the "Calculate Life Earnings" button and scroll down to view the results. Why the rich get richer. You could come up with a multitude of reasons that attempt to explain why the rich get richer. But in my opinion, there's only one reason. The rich get richer because the poor and middle class continue to hand all of their potential wealth over to the rich. After all, the rich are not printing their own money. Where else would it be coming from? I honestly believe that if you put every dollar of everyone's net worth into one account, and then redistributed that amount equally between every citizen of the country, it would only be a matter of a few years before the bulk of the money would end up right back in the hands of the rich. It's because you and I have been taught since birth that the key to happiness is to buy the things that we've been led to believe will make us happier -- even if it means renting (borrowing) the money to buy them. Who's been doing the teaching? And how are they doing the teaching? Easy. They have ivory towers teaming with the best marketing minds money can buy, who in turn enlist the services of highly paid actors and actresses who are experts at making us believe they are actually experiencing the benefits being advertised. And what happens when you add the best lobbyists money can buy? It's what we up North refer to as "hook, line and sinker." So how can we turn the tables on the rich? That's easy, we have to stop playing the "fool" in "a fool and his money are soon parted." And the key to that is to become financially savvy enough to instantly recognize when someone is feeding us a line of bull.